Notes: Many of the new plots feature less and less of Vivian, who is unhappy with her role in the series. She is tired of commuting to Hollywood from her Connecticut home just to play secondary parts. Notes: Note that the Indian outfit and wig that she wears in this episode is the same one she wore on I Love Lucy in "The Indian Show", episode #59. Notes: If you watch carefully, you can spot Keith Thibodeaux (Little Ricky) in the train station coming out the door with Carole Cook who plays his mother. This is his first Lucy appearance since 1960; it is also his last. Notes: This is the final Lucy Show written by original writers Bob Caroll Jr. and Madelyn Martin. Lucille had a difference of opinion with the writers, which lead them to believe they were fired. Feeling betrayed, they will not write for Lucille again until 1970. Notes: According to Lucie Arnaz, in later years it often happened that scripts were written and then rejected. It was very unusual, however, to have a script go into rehearsal and not be produced. Notes: There is a fresh opening for the new season, with clips from both the black-and-white and color episodes strung together. Notes: Comedian Harvey Korman plays the camp counselor. 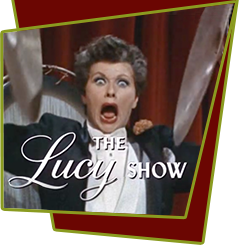 Notes: Norma Varden last appeared with Lucille and Viv on TV in 1953, in I Love Lucy, The Ricardos Change Apartments (Episode #61), as Mrs. Benson, the woman in apartment 3B who switched apartments with Lucy Ricardo.